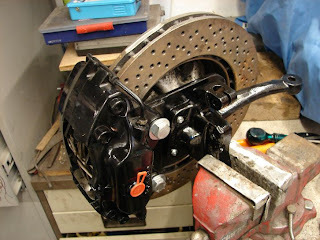 I have now made the calliper mounting plates for my front brake assembly. 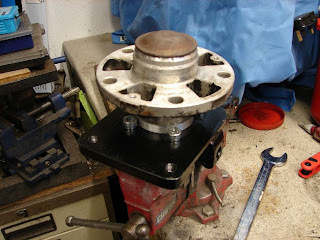 Ages ago I made a template out of an old drum brake backing plate. Then I transferred that to a cad drawing. I printed that off, and made an MDF version, just to check everything was in the correct place. Then I made some steel versions. One of the things I was nervous about was cutting the central 70mm hole. I bought a hole cutter, but wasn't sure it would get through the plate without the teeth wilting! However it did cut though quite easily! I used a friends pillar drill with a nice slow speed, plenty of oil to keep it cool, and it worked fine. 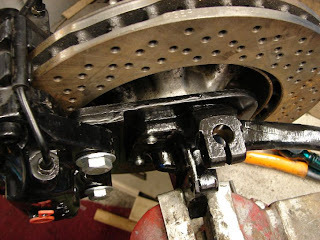 The mounting bolt holes where drilled, and the calliper mount holes were drilled and tapped. As you can see I painted it all black to protect it all, and I am very pleased with the final result. When I filled the system with brake fluid I had a few leaks. Well every joint on to the Goodridge brake lines leaked. I eventually worked out that I had used the wrong fittings. 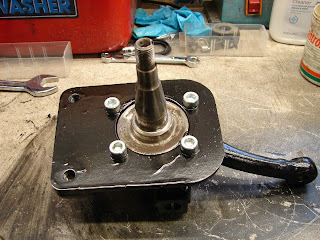 I had used the fully threaded nuts instead of the partially threaded ones. 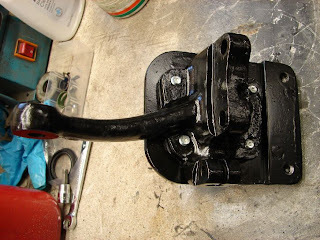 Once I had re-made most of my brake lines, I had no leaks and was able to bleed the system. Now bled and the original master cylinder looks like it will be ok. Pedal travel is obviously further than stock, but its not too bad, and has plenty of reserve travel. Can't wait to try them! Here is the caliper bracket cad file in .3dm format.